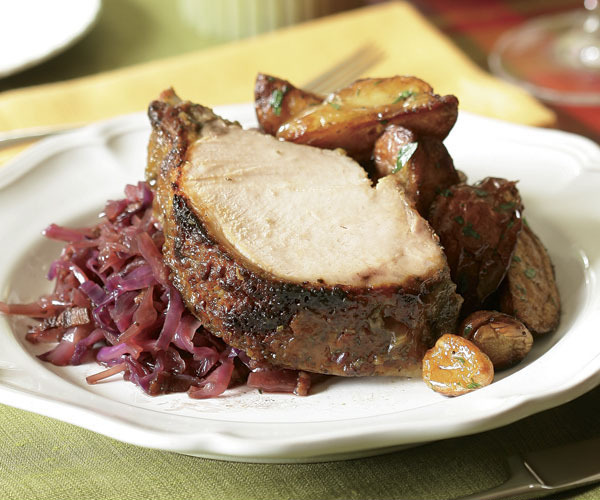 A sweet-and-pungent glaze gives this pork roast the flavors of winter, and make it special enough for a holiday meal. 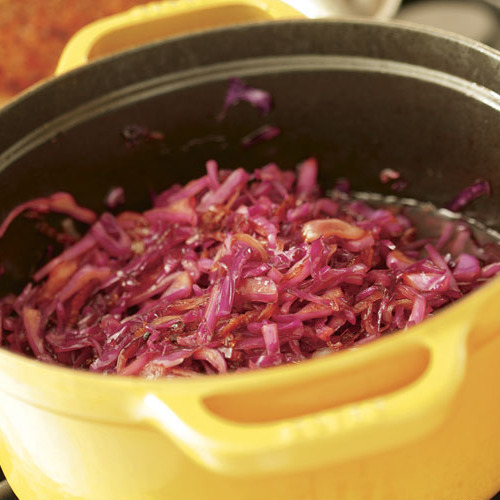 Play up the seasonal flavors by pairing it with Sweet-Sour Red Cabbage. The maple-mustard glaze is also great on pork tenderloin or roast chicken; brush it on halfway through cooking. Heat the oil in a medium sauté pan over medium heat. Add the onion and garlic and cook, stirring frequently, until the onion softens, about 5 minutes. Transfer to a food processor or blender and let cool to room temperature. Add the sage, mustard, maple syrup, soy sauce, 1/4 tsp. salt and a pinch of black pepper. Purée the mixture until somewhat smooth. Meanwhile, shortly before the pork hits 115°F, cut the potatoes lengthwise into wedges about 1-1/2 to 1-3/4 inches wide at their thickest part. In a medium bowl, toss the potatoes with the garlic cloves, olive oil, 1 tsp. salt, and several grinds of pepper. Arrange in a roasting pan or rimmed baking sheet, one cut side down, evenly spaced. Sprinkle with the pieces of butter. When you take the roast out of the oven, put the potatoes on the bottom rack and reduce the oven temperature to 350°F. After 20 minutes of resting, cover the roast evenly with the mustard glaze and return it to the center oven rack. At this time, turn the potatoes with a metal spatula onto their other cut side. Roast the pork until the internal temperature is 140°F. Roast the potatoes until they’re golden and crisp on the outside and fork-tender inside. Both should take about 30 minutes. (check the potatoes at 20 minutes and, if necessary for even browning, flip them back to their other cut side.) Transfer the roast to a carving board and tent with foil. Let the pork rest for at least 20 minutes before carving. Set the potatoes aside in a warm place, uncovered (so they stay crisp and don’t steam), until ready to serve. To serve, slice the roast between the bones into individual chops. Toss the potatoes with the chopped parsley. Arrange the meat and potatoes on a platter. The Mustard, Sage & Maple Glaze can be made up to two days ahead and refrigerated. When ordering the pork, be sure to have the backbone (called the chine bone) removed, so you’ll be able to slice the roast between the rib bones. But since most people love to chew the crusted meat and crackling pork fat off the rib bones, don’t have them scraped clean (butchers call this frenching). I used a boneless pork loin and it turned out really well. The mustard glaze was excellent with tons on the side for a sauce. I would definately make this again. The Sauce for this is amazing! I make it for my pork chops as well.